In a real life version of the Second Best Exotic Marigold Hotel, Hillary and her successor at State got down Bollywood style. New Delhi [India], Dec 12 (ANI): Mukesh Ambani and family, who are known for their larger than life celebrations, have left no stone unturned to make the wedding of their daughter Isha Ambani unforgettable – a proof of which is the sheer grandeur during the celebrations with former US first lady Hillary Clinton in Udaipur. Clinton, who arrived in Udaipur on Saturday, was seen quite excited for the celebrations as she danced to bhangra beats and Bollywood numbers with John Kerry, former US Secretary Of State, the entire Ambani clan and B-Town stars including Shah Rukh Khan, Aamir Khan, Karan Johar, Aishwarya Rai Bachchan among others. In a recent Twitter video, Clinton, who was dressed in Indian attire, can be seen grooving with SRK to hit Bollywood music like ‘Lets Nacho,’ ‘Abhi Toh party shuru hui hai,’ ‘Tune Marri Entry,’ ‘Jumme Ki Raat’ and many others. It was one of the major highlights of the star-studded night. 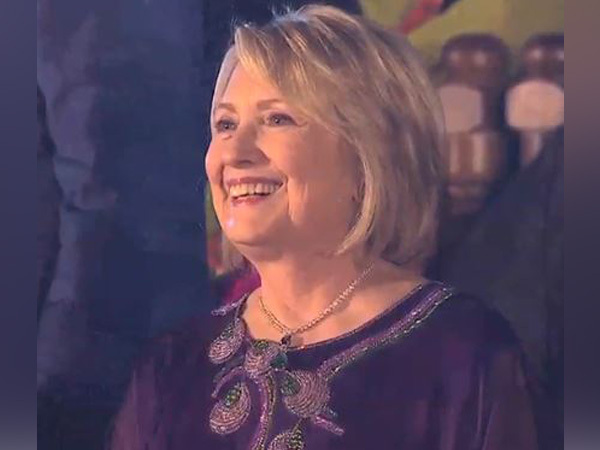 Clinton also visited Swadesh Bazaar, an initiative of Reliance Foundation celebrating 108 traditional crafts and art forms of India, with the bride-to-be Isha Ambani along with her mother Nita Ambani on December 09. Let’s just say every next video from Isha Ambani and Anand Piramal’s pre-wedding celebration is turning out to be crazier than the craziest. I mean, who would have thought we would ever get to see Aishwarya and Deepika dancing like besties one day? Or Deepika and Ranveer’s epic Malhari that was enough to steal the thunder? However, nothing can beat this video of Shah Rukh Khan dancing with Hillary Clinton on hit Bollywood tracks like Abhi Toh Party Shuru Hui Hai, Salman Khan’s Jumme Ki Raat., Priyanka Chopra’s Tune Maari Entriyaan. Yes, this actually happened! Hillary Clinton couldn’t resist herself from joining the gang and shaking a leg on Bollywood songs is when SRK did the honours and helped her with a step or two! Also there in this video are Aamir Khan, Abhishek Bachchan, Karan Johar, Aishwarya Rai Bachchan who are equally seen having a blast on stage with Hillary Clinton and John Kerry. Perhaps, this is one of those legendary moments that deserves to go down the history of Bollywood! Hillary Clinton visited the Self-Employed Women’s Association (SEWA) headquarters here and was joined by designer Anita Dongre. The former US First Lady’s visit was seen as an encouragement for women from rural India. The non-profit organisation has been working towards the upliftment of women in rural India for over four decades. “It was a privilege for me to have been a part of such a special evening with Hillary Clinton and the women members of SEWA. The women were filled with enthusiasm in having such a global powerhouse and woman champion amidst them who took the time to inspire, motivate and applaud them,” Dongre told IANS. “She heard all the game-changing stories of these courageous women and was heartwarming to see her relentless support and encouragement to help these women achieve economic empowerment and independence,” she added. They visited SEWA on Tuesday and were welcomed by Reema Nanavaty who leads the NGO. She has been recognised across India and in the neighbouring countries as a catalyst for various women and helps them achieve economic freedom and liberation. Clinton has been a strong advocate of women empowerment and has had a personal connect with the SEWA organisation for over two decades. Just sent my little great niece off to first grade. Six years ago, parents and caregivers sent their first graders off to school never imagining that they would never see them again. We must never forget this atrocity and that the criminal enterprise masquerading as a political party refused to take action to make sure that this atrocity and many other since can never happen again. Perhaps someday we will have two thriving political parties again, debating and even arguing over big ideas in the tradition of great democracies. That will only happen if the current version of the Republican party is forever consigned to the ash heap of history. Until then, let us remember the children of Sandy Hook. And never forget why they are no longer with us. The first 2020 Iowa caucus poll is a timely reminder that the Iowa caucuses should go the way of the donkey cart. With three white dudes in the lead, (and two of those septugenarians! ), it appears that Iowa caucus goers slept through the 2018 Blue Wave. And as a volunteer in Hillary’s 2008 campaign in Iowa, I can attest that any woman entering the Iowa caucuses had better be a world class mountain climber because she will have to climb a mountain of misogyny. Who’s the 3rd? Beto? We had a chance to get rid of the caucuses. I never agreed with that dual leadership, and didn’t we make a rule about candidates having to be registered Dems? How is Bernie still being classified as a Dem? Yes, Beto. The rule about party membership has a hole large enough to drive a truck thru. There’s really no time frame for becoming a Dem. I think BS can just do what he did last time. Minnesota and a few other states are scrapping caucuses, recognizing that it’s hypocritical to fight voter suppression while endorsing voter suppressing caucuses. Iowa will cling to their caucuses to maintain their status as the first. Having seen the Iowa process up close in 2007-2008, it needs to go for various reasons including no secret ballot. People, especially women, are very intimidated by neighbors and even husbands. If my husband tried to control my vote, I would be looking for a divorce lawyer ASAP! But even so. He is not a Dem now. He should not be in a poll with Dems.